Countless sandwiches are born of food left over from another meal. We at On Sandwiches have had a number of fine sandwiches in that mold. The Nobadeer is the supreme sandwich of the category, the undisputed sovereign of the leftover sandwich. It is the Thanksgiving sandwich. Of course, it isn’t my Thanksgiving sandwich, or yours. Mine involves dark meat, for one, and a touch of gravy. 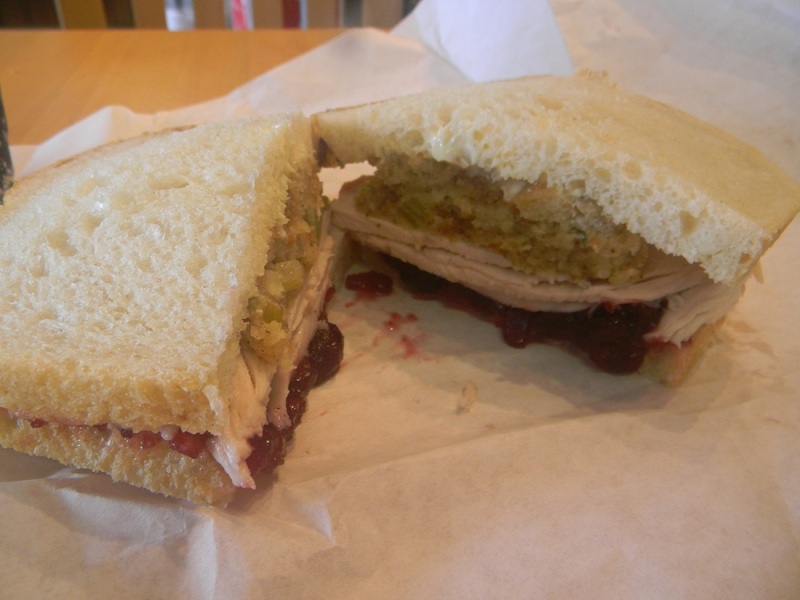 No, this is just the broadest outlines of the archetype: Soft white bread, turkey breast, stuffing and cranberry sauce. (There’s a layer of mayo as well, but it neither adds nor detracts so I’m ignoring it.) That’s the rub of a sandwich like this; you run the risk of stoking a person’s nostalgia without the necessary fuel to really get the fire going. Some restauranteurs see this problem and surrender. They put forth no effort, counting on the simple fact that they’re appealing to sentimentality to carry the sandwich through. That never ends well, dry turkey, bland stuffing, cranberries that are more jelly than sauce. The folks at Jetties don’t take the coward’s way out. No sandwich is going to be everything to everyone, so they just put forth a quality sandwich and dare you to be disappointed. And make no mistake, the Nobadeer is a quality sandwich. Named for a beach in Nantucket, it features freshly carved turkey that’s about as juicy as you can expect a turkey breast to be. The stuffing was moist and savory, and the cranberry sauce, with big bits of cranberry, was neither too sweet nor too tart. It wasn’t a perfect sandwich, with some problems in construction. 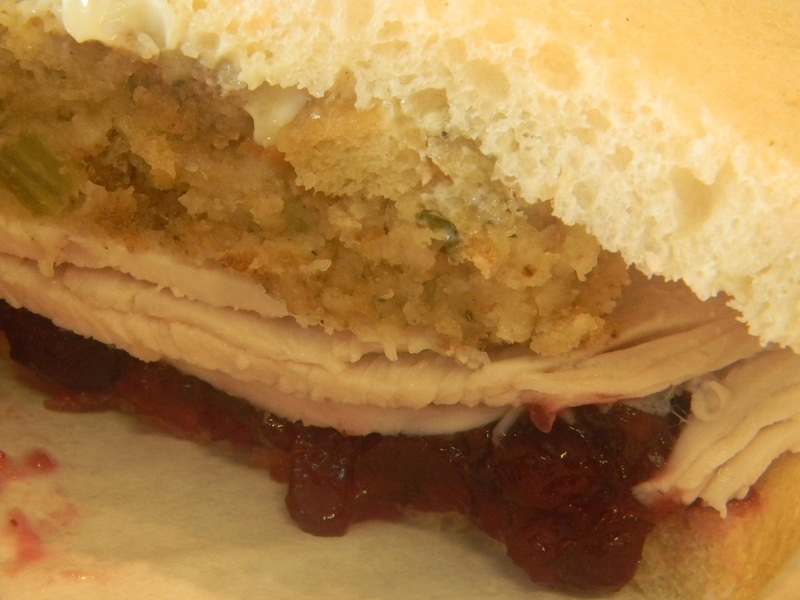 The cranberry sauce and the stuffing were concentrated towards the center of the sandwich, leaving both absent at the edges. With a mediocre sandwich this kind of error can ruin things, but the quality of the ingredients in the Nobadeer carried things through and left it, a few bland bites aside, a great sandwich. This entry was posted in Sandwich Reviews and tagged Sandwiches I Have Eaten, Sandwiches Made For Me, Thanksgiving Sandwich, Turkey, Washington DC by Pete. Bookmark the permalink.